Most of the Western hemisphere was trying to eliminate Aedes aegypti. Why not the U.S.? The exact moment when one of the world’s most dangerous mosquitoes arrived in the Americas is unknown. It’s clear that they came from Africa, and they may have crossed the Atlantic as early as 1495, on some of the first European ships to reach Hispanola. By 1648, when yellow fever broke out on the Yucatan peninsula, Aedes aegypti had definitely arrived. Their behavior upon arrival, though, was unusual. Most of the world’s 3,500-plus mosquito species are innocent of lust for human blood but on these long journeys across the sea, the mosquitoes that survived were the ones willing to bite humans. Female mosquitos females need blood to lay eggs. En route to America, A. aegypti learned to love ours. Now, A. aegypti is one of our boon companions, an unwanted, constant domestic creature that house-broke itself. By the 1930s, this species was found in every country in South and Central America, throughout the Caribbean and across the American southeast. Along with it came the viruses it spread—yellow fever, which once killed a third of the people it infected; dengue, also called breakbone fever because its aches were so painful; and now, Zika. Its growth, though, was not inevitable. Half a century ago, it would not have been possible for A. aegypti to spread Zika in Brazil. In 1958, Brazil was declared free of the mosquito and was leading an effort to eradicate it from this hemisphere. Eradication was to be the culmination of decades of work, by scientists who let themselves be infected with yellow fever, by an Alabama soldier determined to clean up Cuba, and by a fanatical epidemiologist with an authoritarian streak, to beat both Aedes aegypti and the diseases it carried. The United States has had a complicated relationship with A. aegypti. Today’s Congress has been reluctant to allocate funds to fight Zika: President Obama asked for emergency funding in February, and it’s taken until June to get close to an acceptable deal. This hesitation is in keeping with the American government’s history with the A. aegypti mosquito. Even while American money was funding eradication efforts, led by Americans, in countries further south, the American government was one of the last holdouts in the hemisphere-wide effort to destroy A. aegypti. At the same time as the U.S. Public Health Service at last started trying to eradicate Aedes aegypti from the southeast, another branch of the U.S. government was planning to raise colonies of millions of A. aegypti mosquitos, to use as biological weapons. The Aedes aegypti mosquito’s first sworn enemy was stationed in Havana, Cuba, after the Spanish-American War. Just before the turn of the 20th century, the island had enlisted American help to wrench its independence from Spain. By 1900, Havana’s city wall had come down, and the city, with its cobbled streets and wealth grown from sugar cane, was on its way to becoming the Paris of the Caribbean. One of its dangers, though, was yellow fever, which had infected 2,000 soldiers fighting in the Caribbean and 20,000 more training in the American southeast. William Gorgas’ job was to help stop it. Gorgas was born in Mobile, Alabama, in 1854. His family spent the Civil War in the Confederate capital at Richmond, where his father was chief of ordnance for the Confederate Army. Like his father, Gorgas became a soldier, in the U.S. Army Medical Corps. Before he came to Cuba, he had lived in Texas, where he contracted and survived a mild case of yellow fever, making him a prime candidate for jobs controlling yellow fever epidemics. In Havana, Gorgas cleansed the city of filth, believed to be the cause of disease. But he could not beat it back. At the turn of the century, when germ theory was still relatively new and viruses a recent discovery, only a couple of people believed that yellow fever might be carried by mosquitoes. One was Jesse Lazear, a young worker on the U.S. Yellow Fever Commission. Lazear had borrowed the idea—and a set of mosquito eggs—from a Cuban scientist, Carlos Finlay, who was widely regarded as a crank. But Lazear was a discipline of bacteriology, and he believed Finlay’s theory that A. aegypti could transmit yellow fever. Lazear and his colleagues had not yet discovered that yellow fever needed to incubate for more than a week inside a mosquito before it was truly infectious, and their first attempts to prove mosquitos could infect men failed. One day, Lazear showed his colleague a test tube-bound mosquito, that had fed on a yellow fever blood and that looked like it might die. The colleague coaxed the mosquito onto his arm: he held the mouth of the test tube to his skin, and let the mosquito eat. This wasn’t the first time the scientists had let infected mosquitos bite them, but it was the first time it worked. Three days later, he was sick with yellow fever. He recovered. A second confirmation of the mosquito’s transmission came when Lazear allowed a mosquito in a yellow fever ward to bite him. He died from the disease less than two weeks later, on September 25, 1900, at age 35. Lazear provided enough evidence for the commission to launch a controlled experiment that proved A. aegypti mosquito carried and transmitted yellow fever from person to person. That was all the information Gorgas needed. At first, he tried to inoculate soldiers with bites from infected mosquitoes, but after a number of fatalities, he decided on a new strategy: he would destroy the insects instead. Aedes aegypti once laid their eggs in watery tree holes (and will still, given the opportunity) but now, after biting, they tend to choose containers of standing water left by humans. Plant pots, watering cans, forgotten milk jugs, tubs, bottle caps, toys, discarded appliances, old wrappers, used tires, a soda can, a plastic wading pool meant for children—these are all perfect places for A. aegypti mosquitos to lay their eggs. These mosquitos are not great flyers, and they will stay close to where they are born. Humans give them everything they need: a source of blood, and convenient containers of water in which to lay their eggs. Using his military authority, Gorgas sent out soldiers to look for any mosquito breeding ground, no matter how small. They sought out standing water, rid the city of every container they found, oiled natural water sources to keep larvae from growing on their surface, and punished anyone who did not comply. It worked. Gorgas’ anti-mosquito crusade began in 1900, and by 1901, no one was dying from yellow fever in all of Cuba. That same year, Brazil started a similar program to rid Sao Paolo of mosquitos; Gorgas was soon dispatched to do the same work in Panama, where the U.S. had begun to build a canal. Late in his life, in 1920, King George V knighted him for his work as the world’s greatest killer of A. aegypti. At the time, he had done more than anyone else in the world to try to break up the love affair mosquitoes had with humans. That was before Fred Soper came to Brazil, though. Fred Soper was from Kansas, and at some point, growing up on those empty plains, he developed a striking intensity. Infectious disease specialists who knew him say he had “tunnel vision” or “an evangelical view of the world.” Malcolm Gladwell once described him as the “General Patton of entomology.” In all accounts, he is extremely driven, extremely organized and extremely uninterested in human weakness. The Rockefeller Foundation, which had pledged to rid the world of yellow fever, recruited him when he was young, and sent him to Brazil to work on the disease there. By 1920, Rio de Janiero had grown to a million people, and though earlier a campaign using Gorgas’ techniques had rid the city of yellow fever, it came back in 1928. A strain had been hiding in the jungle, kept alive in mosquitoes and monkeys. Fred Soper went to work. Soper’s strategy divided Rio into small zones, each with a brigade of inspectors, who were tasked with going into every building and inspecting every household, including cisterns and gutters. They would remove all potential breeding grounds, and they would also use insecticides, like the arsenic-laced Paris Green to kill mosquitoes. A supervisor would follow, and re-inspect. If he found any leftover mosquitoes or larvae, he would get a bonus. No one was allowed to turn the inspectors away. Soper had the backing of Brazil’s authoritarian government, and people who did not comply with his regime would be punished. Soper also held his inspectors strictly to the regime he created. In one story, he learns that an armory has exploded, checks the strict schedules for inspection, and finds that one of his men was at the site. He sends condolences to the man’s widow. When the inspectors shows up for work the next day, Soper fires him, for being alive. Eradicating A. aegypti became Soper’s legacy, but at the time, it wasn’t his goal. He wanted only to ensure that under him, unlike under his predecessor, all inspectors’ work could be verified. In 1932, satisfied with the system he had set up, he went home for a leave. When he came back to Brazil, in April, A. aegypti had disappeared from eight cities in northern Brazil. It happened. But how do you just destroy every mosquito in a city? After previous Rockefeller attempts to eradicate mosquitos from even smaller places, it was thought an impossible task. “He did it because he was Fred Soper, and no one else had ever been like him,” says Scott Halstead, one of the world’s top mosquito-borne virus experts. The secret of eliminating A. aegypti was that you couldn’t miss anything. Soper had the discipline to maintain that level of detailed scrutiny, and the drive to keep pushing for more. In 1934, he proposed eradicating A. aegypti from the entire country. In 1947, the year Zika was discovered, he had convinced enough people that eradication was possible that a consortium of American countries endorsed a plan to rid the entire hemisphere of the mosquito. Most of the countries succeeded. By 1962, there were no A. aegypti to be found in 18 continental countries and a number of Caribbean islands. Only a few hold outs had failed to start programs to destroy these mosquitos. The one that made Soper the most frustrated was his own. In the 1950s, while in South America military-like brigades were hunting down Aedes aegypti, in the United States, the Army was falling in love with the same mosquito. At Fort Detrick, the military’s biological weapons base in Maryland, in great secret, Army scientists were considering how fleas, grasshoppers, and mosquitoes might be deployed against the Communist threat. These insects were harder to protect against than gas— masks wouldn’t help. The threat they posed would last, as long as a population of insects remained alive. Plus, it would be very difficult to pin an insect-borne attack on the U.S. Even now, there’s a limited amount of public information about these experiments, and much of what’s known comes from one Chemical Corps report published in 1960. Mostly, though, it seems that Army mosquito researchers were raising hordes of insects and releasing them in different situations. 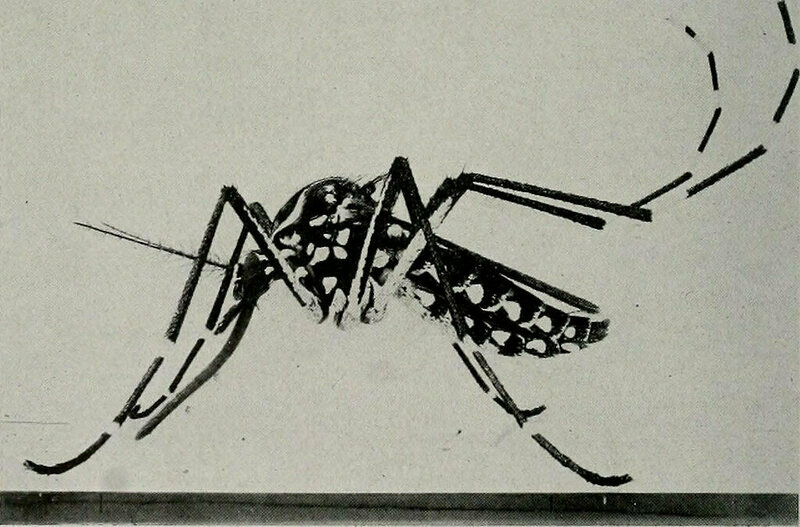 In 1956, looking to see how quickly and how well A. aegypti could penetrate houses and spread through the area, the Chemical Corps released a fleet of uninfected female mosquitos in a residential area of Savannah, Georgia, and collected data from locals on how often they had been bitten. (There’s no information about which neighborhood was afflicted; apparently the Corps had the “co-operation of people in the neighborhood,” although it’s not clear they knew they were part of an experiment.) That same year, the Corps started experiments in Avon Park, in Florida. They would load hundreds of thousands of mosquitos into planes and, later, helicopters, then drop them over the field and see how far they could spread. It’s unlikely that the Public Health Service knew what the Army was doing—the Army’s program was a closely held secret, and details did not start becoming public until the 1980s. But at the end of the 1950s, the two branches of government were working directly at odds to one another. As the Chemical Corps reports details, in 1957 and 1958, the Army was releasing A. aegypti in Avon Park, in the middle of the Florida peninsula. In those same years, in the Panhandle, the Public Health Service had finally started a pilot program to eradicate A. aegypti in Pensacola, Florida. He was right about that. Even after Congress did fund eradication in the U.S., the way the public health service did the work here was nowhere near as effective as Soper’s work in South America. American public health officials did have some good reasons for opting out of Soper’s program. Public health dollars were hard to come by, and yellow fever and dengue had not been a problem in the U.S. for decades. Through a combination of vaccines and water drainage projects, Americans had beaten back the threat of epidemics. In the U.S., too, it would be hard to implement the same program that Soper had pioneered in South America. No one was going to give mosquito inspectors unlimited authority to enter private property and destroy anything they thought was a threat. In 1963, not long before President Kennedy’s death, Congress did allocate the public health service $3 million a year for A. aegypti eradication. The program was given five years to kill all the mosquitos. From the beginning, it was set up to fail: the director of the program estimated that, in fact, it would take three times as long to eradicate the mosquito from places it had been found—ten southeastern states, Hawaii, which had only just entered the Union, the Virgin Islands and Puerto Rico—and cost $100 million. A year into the program, the health service reported that progress already “has been hampered” by the logistics of “the procurement of equipment and recruitment of personnel.” Part of the logistical problem was lack of money: Because the funding was so low, the health service had trouble hiring qualified people for the hundreds of jobs involved. Even if the program had been well funded and its workers eager and qualified, though, there was a fundamental difference with the U.S. eradication program. In Cuba, in Brazil, and in many of the other South American countries, no one was allowed to deny mosquito inspectors entry, and if the inspectors found mosquitoes, a family could face substantial fines. In America, that wasn’t going to fly. If just one household in a neighborhood hosted Aedes aegypti, it would be enough for the mosquitoes to survive and spread disease. But if that household wanted to keep water-collecting trash in the yard and breed A. aegypti, the government wasn’t going to stop them. By the time Congress did fund Aedes aegypti eradication, people had good reason to turn mosquito hunters away, too. Since World War II, one of the most powerful tools that eradicators had against mosquitoes was an efficient and effective insecticide—DDT. Just a trace could kill bugs dead, and mosquito eradicators used it to eliminate any mosquitoes they found, and any that would come later. Rachel Carson’s polemical Silent Spring had come out in 1962. By the time inspectors were making their rounds, in 1964 (also the year in which the first human case of Zika was documented), plenty of families no longer wanted anything to do with DDT or the men who loved it. They turned the inspectors away. After four years, Congress defunded the program. When A. aegypti attack, they prefer to bite at dusk. They come at their target silently. They go for our ankles. They’re skittish. Twitch a muscle, and the mosquito will withdraw its proboscis, wait, and reinsert. That’s part of what makes them so dangerous. Every time the mosquito tries again to draw blood, the viruses it harbors have another chance to squirm into a person’s bloodstream. Not to anthromorphize too much, but these bugs are sneaky. “Whether they achieved true eradication or not—and perhaps there were places they actually did—clearly they knocked it back, pretty substantially,” says Tabachnick. But even that had required years of work and a huge investment. To keep mosquitoes from returning to areas of eradication would require keeping up the same level of vigilance, for as long as A. aegypti lived in the world. But that’s not how politicians think: once the problem disappears, why spend money on it? When people who worked for decades to eradicate A. aegpyti started retiring, they weren’t replaced. “The governments sat back and said, well, Aedes aegypti is gone. That’s a problem solved,” says Halstead, the mosquito-borne virus expert. “Everyone just let down their guard.” Another infectious disease stalwart, Philip Russell, who directed the Walter Reed Army Institute of Research, remembers going to policy meetings in the late 1970s where Brazil was still pushing eradication, with no success. “The Brazilians were pounding on the table to continue the eradication campaign, and the U.S. was saying, nope, can’t do it, not going to do it, forget it,” he says. Soon, meetings on pan-American public health would involve maps of Brazil showing how fast Aedes aegypti was moving back into previously eradicated territory, taking back hundreds of miles, month after month. Today, the mosquito has taken over more of the Americans than ever before, in cities that have grown enormously. The metropolitan area of Rio de Janeiro is now home to more than 13 million people. Airplanes move disease across continents. More than ever before, the human world is a dream for mosquitos. Since the 1970s, disposable plastic containers and other bits of mosquito-ready trash have multiplied. Like the monsters in any good horror movie, A.aegypti are getting better and stronger. One scientist found a population that had survived four winters underground in Washington, D.C. A couple of scientists at the University of Washington are collecting evidence that A. aegypti can learn—and that they may be “more sophisticated, individually complex, and formidable than anyone imagined,” according to The Stranger. If humanity ever had a chance of tossing Aedes aegypti out of our cast of domesticated creatures, it’s gone now. We’re stuck with them.